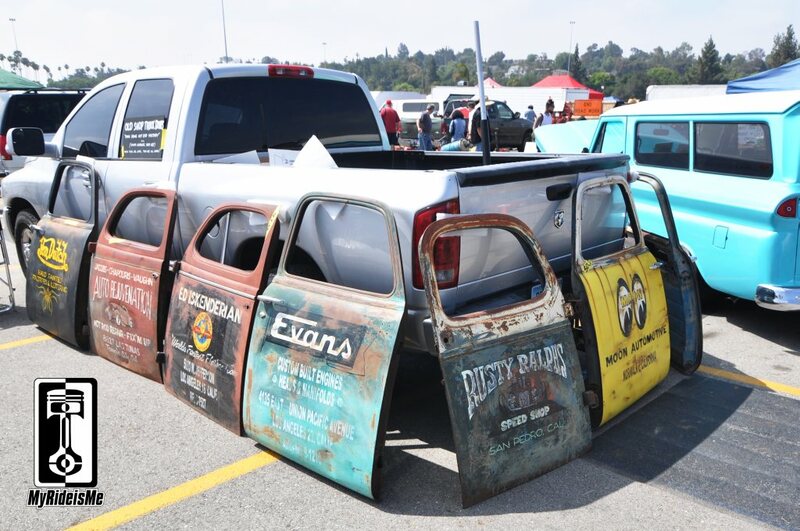 As soon as we stepped into the swap meet at the 2013 LA Roadster Show, we found Gary Crisp and his custom painted doors. In a time where patina is IN and faking patina is about a common as the real stuff, Gary’s work is tough to beat! Who knows what condition the doors were in when he got them, let’s figure they were rough… but the end product is outstanding! The lettering and art, even up close, look to be good’n old. Gary’s a custom painter by trade. Mostly hot rods and bikes from what he told me, but now he’s just having fun painting doors. As you can see, he’s fairly successful at it with a few of the doors already marked as “sold” and I heard an order for one happening as I waited to say hi. Get your own custom doors by reaching Gary by email. He’s a little old school when it comes to computers, so give him a few days to respond. Thanks Gary! 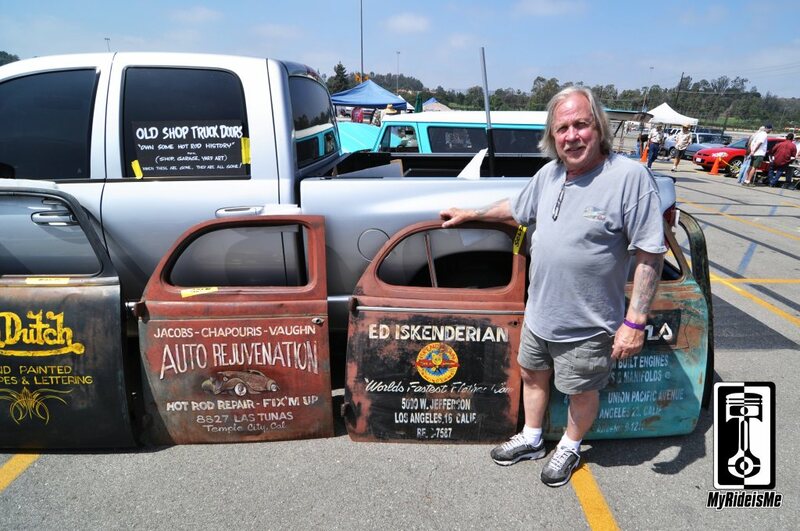 If you do a little resurch on Gary you will find that he has won the worlds best painter for a 1923 ford roadster, done bikes for easyriders, nascar, very high end customs in his shop in Arizona. You were talking to the Barris of custom paint and did not even know it. Have fun doing your resurch!! Thanks for the insight Allen. Gary was so laid back, you’d never know. Are these officially licensed by the brand names on the doors? The guy is talented, but if he’s not paying a licensing fee he’s riding the coat tails of the companies that worked hard to make their names. 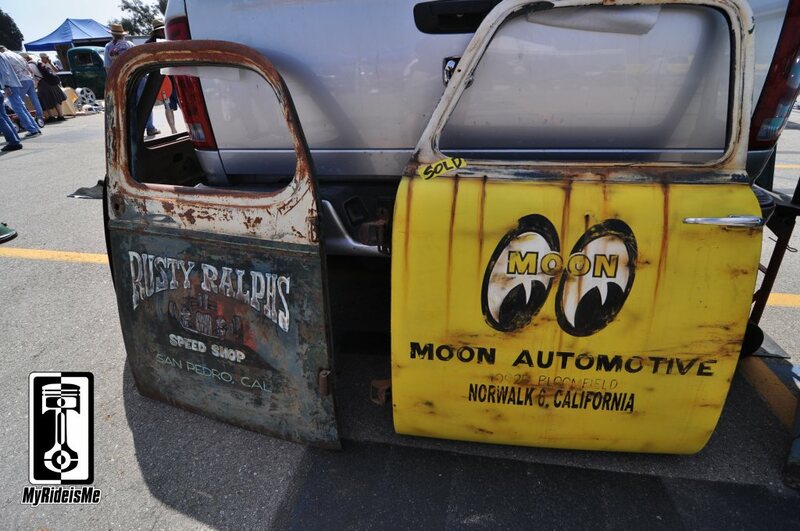 Actually, if he sold the Moon eyes door, yes Moon Eyes would have a problem with that. Let me give you a super simple example. If I make a sign with this painter’s shop name and logo on it and sell it, without his permission, do you think he’d be upset? Or we can just ask this site, My Ride is Me, the same question. Would they be upset if I made “art” with their name brand on it and sold it for my personal gain and they get NOTHING from their hard work of building their name? I truly appreciate your work, and I am inspired to attempt some custom lettering. Can you offer any suggestions. I have been sent an image of some painted text that he has a liking for, but I have not been able to find these fonts when googling or searching through yahoo image searches. I can send an image to you, if you would take a look and let me know what you think the style name could be. Did Gary use to be from Eugene Oregon?I new a Gary Crisp here that did custom paint? I will be leading project paining a food truck for the refugee organization. Participants will be the refugees themselves from different countries. I am an artist and had students paint the indoor mural. My questions since I never painted on trucks, what would be the process and what kind of paint, besides enamel we can use? Is there a way to paint it indoor and than assembly it in the truck? Ed Roth right out of high school, and later doing a lot of custom work on hot rods featured at the Portland Roadster Show.